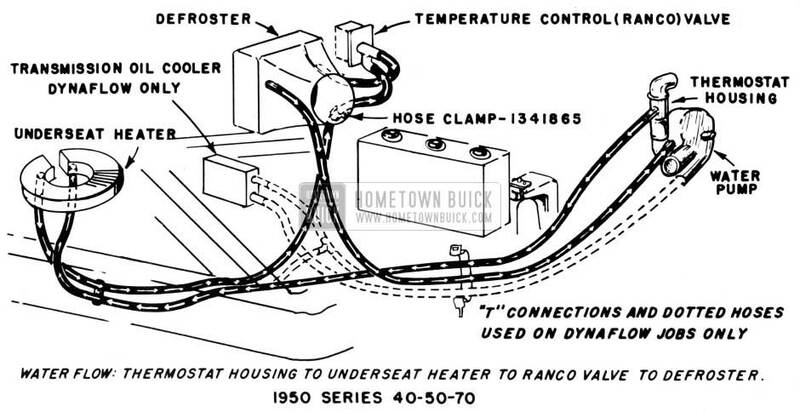 Where owners of 1950 models desire cooler air at the upper level for ventilation under normal winter driving conditions, the heater hot water hoses may be reconnected to cause the water to flow first through the under seat heater and then through the defroster. This will result in appreciably cooler and fresher air at the defroster outlets and a slight increase in temperature at the heater outlet. There will be no loss in the maximum defroster air temperature when the control valve is turned wide open for deicing. Remove thermostat housing to temperature control valve hose and discard. Disconnect defroster to heater hose at defroster and reconnect to temperature control valve inlet. Disconnect heater to water pump hose at water pump and reconnect to thermostat housing. Install a new piece of hose 48 inches long from defroster outlet to water pump. Install hose clamp, 1341865, to inner side of defroster housing to hold heater to temperature control valve hose away from the battery case. Disconnect formed hose, temperature control valve to” T” connection and discard. Disconnect defroster to heater hose at defroster outlet and connect to temperature control valve inlet. Remove transmission oil cooler to “T” hose and replace with a piece of hose 14″ long. Cut heater to water pump hose at “T” connector and connect section from heater to “T”. Connect hose from water pump to defroster outlet. The valve is locked off when the knob is in the position shown at the left in the diagram with the word “warmer” horizontal and the “W” at 9 o’clock position. Rotating the knob clockwise opens the valve. When “W” is at 10 o’clock the valve is set on low automatic. The automatic range extends to 6 o’clock. Rotating the knob further to the 7 o’clock position locks the valve wide open for de-icing under severe conditions. The valve should only be turned wide open when maximum deicing is required. Under normal conditions the car will warm up to the desired temperature fully as fast with a low control valve setting as with a high setting. Setting the valve too high and then lowering when the car becomes too warm causes the valve to shut off completely with the consequent cold air flow until the car has cooled down to the temperature corresponding to the new setting. We have had several complaints that Windshield Washer Solvent, Part No. 1/12 – 980807, does not keep the washer solution in a liquid state at low temperatures. The concentration of anti-freeze in this solution is sufficient to prevent it from freezing solid; but it will form “slush” at low temperatures in the same manner as the cooling system anti-freeze. Under no condition should a standard anti-freeze solution be used in the windshield washer, nor should the regular Buick solvent be used in proportions greater than specified on the container. Either of these conditions will cause damage to the body finish. In cold weather, when the washer solution is liable to “slush,” the old type narrow top bottles should be filled only 3/4 full to prevent breakage of the bottle. Two different 1950 Buick radios are available for all 1950 models; the Sonomatic and Selectronic. The Sonomatic radio, which is similar to that previously used, has five push buttons for station selection, using the push pull lock up tuner. Turn on 1950 Buick radio. Push button all the way in. All five buttons are set up in this manner. 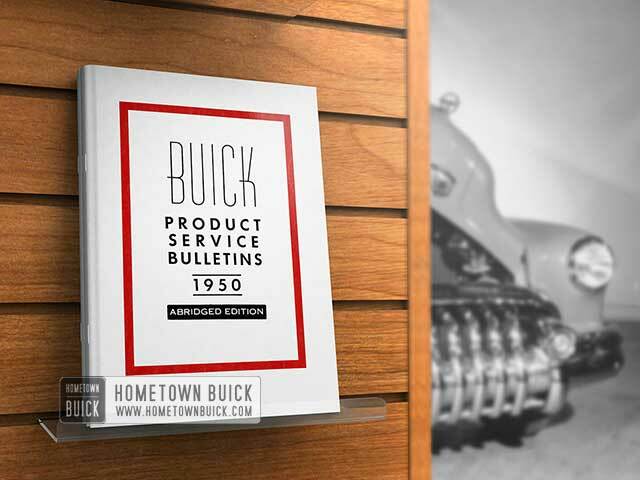 The Selectronic radio is new with the 1950 Buick models and has several features not present in the Sonomatic set. The Selectronic Radio requires no pre-setting of push buttons. With 1950 Buick radios using conventional type push buttons, it is the usual practice to set push buttons for stations that come in best in a given locality. 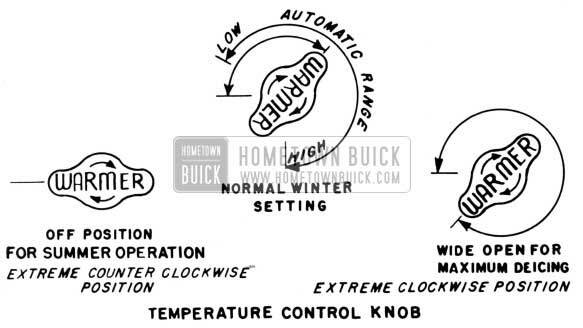 Hence when users drive away from this area, sometimes for a comparatively short distance, it becomes necessary to tune the 1950 Buick radio manually or reset the push buttons to a new group of stations. This is unnecessary with the Selectronic radio. All that is required to change stations is a tap on the station selector bar located at top of radio or the foot switch. The pointer then scans the dial until it reaches the next radio station, that is strong enough for good listening and stops accurately tuned. The foot operated station selector switch enables the user to change stations without removing his hands from the steering wheel. This switch is conveniently located on the toe board. The automatic tuning accuracy of the Selectronic radio is much better than the average individual can accomplish when tuning manually. Many users report that tone has been improved on the Selectronic radio; this is because all stations are so precisely tuned that it allows both high and low notes to be reproduced naturally. For proper operation of the Selectronic radio, antenna should be turned to the up position and fully extended. The sensitivity control knob permits the user to reduce or increase the number of stations to which the receiver will respond when either the station selector bar or foot switch is used. NOTE: This control does not effect the sensitivity when manually tuning the 1950 Buick radio receiver. In metropolitan areas where reception from local or other strong stations “come in” with less interference and noise, it is often desirable to reject those weaker or more distant. Thus the entire Broadcast Band may be scanned more quickly, minimizing the annoyance of “tuning in” many unwanted stations. When this is desired, the sensitivity knob should be rotated toward ”less” as indicated by the arrow in single notch increments until the desired result is obtained. The locator notches may be used to re-establish this position by counting from either extremity of movement. It is necessary to have the antenna fully extended for operating under the above conditions. Moreover, the sensitivity knob should be rotated toward stations “more” as indicated by the arrow until the result best suited to the signal conditions and individual choice is obtained. The receiver will not, of course, bring in ”more” stations if conditions are such that the signal level is below the operating threshold; even though the tuner continues to scan the dial backward and forward in search of stations. For this reason it is more important than ever that the 1950 Buick radio be turned off when car is parked. In certain shielded areas or structures, an inadvertent kick of the foot switch may otherwise set the tuner in motion and cause it to scan backward and forward until the battery is discharged. It is advisable to familiarize the customer with the operational details given above. It is recommended that the dealer deliver the car to the customer with antenna fully extended and with sensitivity knob set to stations “more”. The customer should be cautioned to rotate 1950 Buick radio antenna down when entering or leaving garages with low overhead-type doors to avoid bending the tubular sections. IMPORTANT: USE ONLY 15 AMP. FUSES ON FOR YOUR 1950 BUICK RADIO. 15 amp. fuses are available from UMS Distributors and Buick Warehouses. A few reports have been received that Selectronic receivers having reached dealers have a dummy knob (Part No. 1341535) installed in error in place of the Sensitivity Control Knob (“More” Stations “Less”). This of course, prevents proper setting and the correct Knob (Part No. 1341337) must be installed.